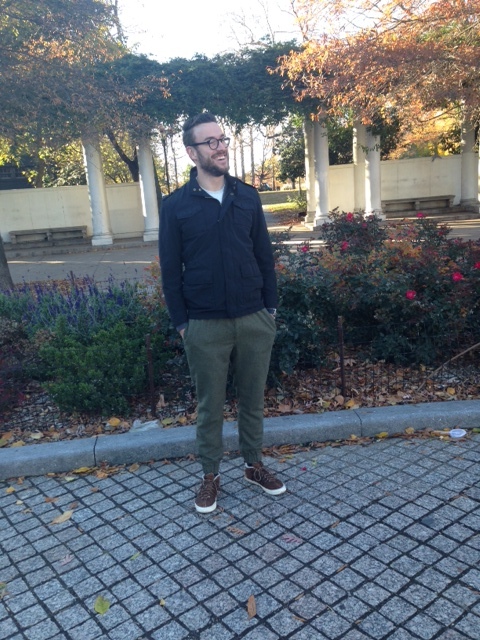 November 17, 2014 November 17, 2014 by Beau H.
Rocking some leather sneakers — perfect for the fall & winter. Jacket by Frank & Oak. Long-sleeve T-shirt by J. Crew. Sneakers by Billy Reid for K-Swiss. Watch by Stuhrling. Glasses by Burberry. Photo credit: Liz Todd. Even though it’s getting closer and closer to December (and thus the start of real winter), there should still be opportunities when the snow clears to put away a pair of thick boots and instead reach for some more casual, laidback footwear. 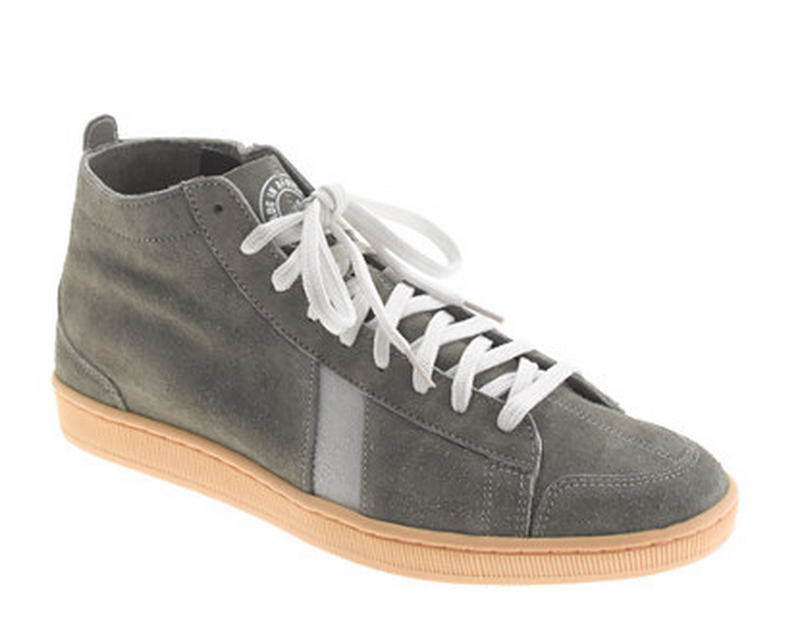 Specifically, a pair of leather sneakers should do the trick. While white sneakers offer lots of wearability in the spring and summer, darker shoes just make more sense for fall & winter. We’ve been seeing a lot of brands launch luxury versions of athletic-inspired sneakers — even Tom Ford offers rich leather kicks now. And brands like Frank & Oak have gotten a lot of publicity for their more affordable takes on the dressed-down silhouette. Given the variety of shades and their versatility, footwear that clean and crisp can easily be worn with chinos and a blazer (my personal favorite from that launch would be the chestnut low-top sneakers below). 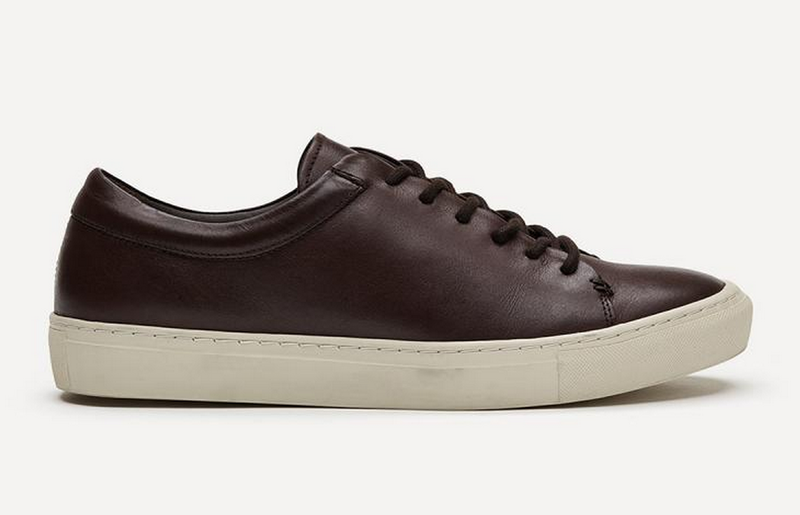 One of Frank & Oak’s takes on the luxe leather sneaker. 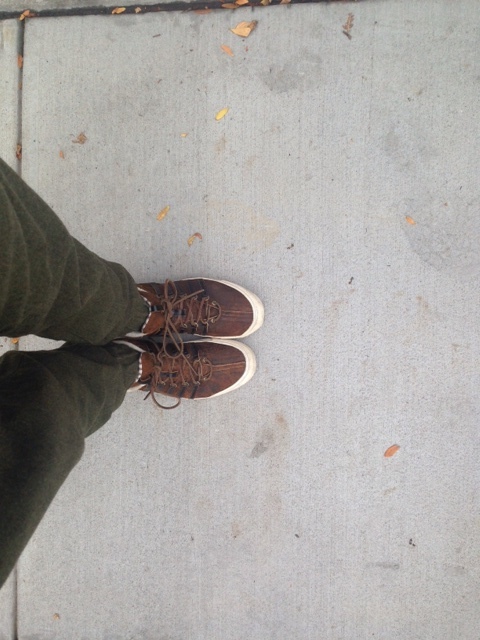 However, in the fall and winter, sneakers should definitely also lend a rugged appeal to an outfit. The great thing about the sportswear-inspired takes we’re seeing on so many shoes is that they’re also blending elements of fashion with athletic vibes — take American menswear designer Billy Reid’s collaborations with K-Swiss. The most recent run of sneakers in that collaboration vanished off the site quickly — the pair in the photos here was scooped up in July during a sale, and now they’re nowhere to be found on the K-Swiss site. No need to despair though — other retailers are still stocking them. Plenty of excellent, fall-ready alternatives are out there, from J. Crew’s suede Sawa sneakers to the Frank & Oak options mentioned above. Additionally, the Ellington and McQueen models from footwear brand CLAE bring lots of cold weather-centric texture with minimal logos and clean design. Given the nice mix of crisp styling and fall-ready colorways available, matching these sneakers up with an outfit isn’t too hard at all. More rugged than Frank & Oak’s, but just at ease with slim joggers. In dark brown or even black leather, sneakers like the ones above can be paired with slim joggers (like J. Crew’s Wool Sideline Pants, as seen here) or dark denim, a henley and a rugged workwear-inspired coat. In particular, the K-Swiss sneakers shown here strike just the right balance between crisp and rugged — the dark brown color allows them to fit right in with auburn chinos, a cardigan and a blue OCBD, while the distressed leather, sporty diagonal stripes and rawhide laces give them a hybrid vibe that pairs perfectly with the equally hybrid wool joggers from J. Crew. Olive chinos or jeans, in a similar shade to the joggers above, would also complement darker brown leather nicely. These have also gotten use with a shawl-collar cardigan and even simple long-sleeve T-shirts. More vitally, these sneakers have held up well being worn two or three times a week — keeping the sole clean is going to be vital with any pair of sneakers, and given the potential for fall or winter rains, treating them with some sort of waterproofer (especially for suede options) will be key. A fall and winter-ready alternative to the Billy Reid for K. Swiss option pictured. For the rest of the fall and winter, my Billy Reid for K-Swiss sneakers will continue to get lots of wear — they’re rugged and sporty, yet the rich, distressed leather doesn’t look out of place with less casual get-ups. Grab a clean, crisp pair and they’ll go well with just about any outfit over the coming months.